… Or how to make ice cream without a freezer, electricity or ice! I think I’ve mentioned at some point that I don’t really care much for cookbooks, that I don’t own a lot of them, but that the few I do own, I absolutely treasure! This holds especially true for my small, but growing collection of vintage cookbooks; that is cookbooks dating back to the 1960’s and earlier. Gastronomie Pratique: This early 1900’s recipe calls for four large Périgord truffles to be boiled in a bottle of the world’s finest white wine.. For starters! The book itself is a work of art and sheer genius as it offers a rare glimpse into the mindset and lifestyle of the turn of the century French upper middle class, but also demonstrates a complete lack of restraint when it comes to ingredients and procedures. Half a liter of good wine such as Mersault, Montrachet or very old Champagne. Alongside 300 grams of butter, two types of fish and a few dozen other ingredients as well. The Montrachet (arguably the world’s finest and most expensive white wine), in case you’re wondering, is used solely for cooking the truffles. Why settle? Want to know more about this iconic cookbook? Check out this article! Gastronomie Pratique is just such a pleasure to fan through, not only because it contains ridiculously extravagant dishes that no one in their right mind would dare construct today, but also because it displays an authentic and undeniable love for food, for cooking, for procedures, for high quality ingredients and for attention to details. The instructions for certain dishes literally span pages, telling you just what to reduce when by how much, and what to mix at which point to pull the most possible flavor out of your ingredients. It has a level of detail and a love of the sublime that you just won’t find anywhere in modern cookbooks, and as an added bonus, it has some pretty hilarious, obviously narrow-minded and very politically incorrect observations on culinary opponents of the French kitchen and other outsiders. It’s a great read, a culinary treasure and I adore it. It truly sparked a fascination with vintage cookbooks and old-fashioned cooking in me. There are two kinds of people who can really teach you how to cook: the French… and your grandmother! Now, all this French extravaganza is all fine and well and while I do draw on a lot of influences from the French kitchen, I don’t usually break out the Montrachets and the Périgord truffles when I want some good and easy, old-fashioned, classic cooking. In those cases, like so many men before me, I turn to the cooking of my grandmother. Cocktails from the 1940’s and a 1960 reprint of a guide to modern pickling. Now, stop me if you’ve heard this from other men, but boy my grandmother could cook! And she did so without lobsters, truffles, oysters or expensive wines. Having been a poor farmer’s wife all of her days, she did what she could with the ingredients she had, and she still managed to produce some of the most memorable meals of my life. Which just goes to show that the most important ingredients are not Périgord truffles or Montrachet wines; it’s time, love and dedication. Sadly, I lost my grandmother to cancer at much too young of an age only a year ago, so I’ll never again be able to have her roast chicken, her ox tail soup or her homemade preserves! But I do have her cookbooks, so I’ll be able to make them myself! See, another few treasures in my vintage cookbook collection include a couple of 70+ year old Danish classics: Tørsleff’s guides for modern housewives. A series of small, colorful, an extremely inexpensive books aimed at teaching Danish housewives a wide array of recipes within a certain field, each of them spanning a single topic such as pickling and preserving or desserts and each of them strangely enough advocating the use of products produced by the company responsible for publishing the books. Coincidence? I think not! Very early forerunner of content marketing? I think so! I own two original copies of these Danish classics: the little green book on pickling and preserving and the little yellow book on desserts. (Yes, there’s a little red one, too, but it’s on lunch – not socialism or how to be a good Chinese citizen) My copies were not actually owned by my grandmother, who wore hers out completely from repeated use, but rather were gifted to me by a kind-hearted colleague not too long ago. Now, I may not be your stereotypical housewife, but I do enjoy good, honest, simple, old-fashioned, Danish cooking and I have been known to experiment with pickling. Consequently I’ve had a lot of fun just flipping pages in these books, seeing how things were done back then, picking up stray thoughts and ideas and just plain getting wiser (or more confused). It’s been fun! The thing about us food bloggers is we tend to be always on the edge, attempting new techniques, and unnecessarily complicating things. Sometimes it’s great to just keep it simple (stupid) and for those kind of days it’s good to have these vintage texts to show us just how delicious simple can still taste. Speak Danish? Love cooking? Have a thing for classic recipes? Want to keep it simple? Check out the books here! First published in the 1940’s, these books are actually still in print today in updated versions. Those, however, are not nearly as fun as the original versions that I have. For instance, I’m reasonably sure the updated version of the dessert cookbook doesn’t include a paragraph on how to make ice cream without the help of a freezer, or electricity for that matter. Making ice cream without a freezer is simpler than you’d think..
That’s right, you do remember the subheading of this post, right: how to make ice cream without a freezer, electricity or ice. Well, look no further, here’s the original recipe straight out of the 1940’s. Check it out for an example of why I love vintage cookbooks or a guide to what you should do the next time you want to make ice cream in the winter when the power is out. Making ice cream without a freezer is easier than you'd think as proven by this 1940's recipe. Why you'd want to do it, I don't know, but here you go. Source: Tørsleffs Husmoder Service. 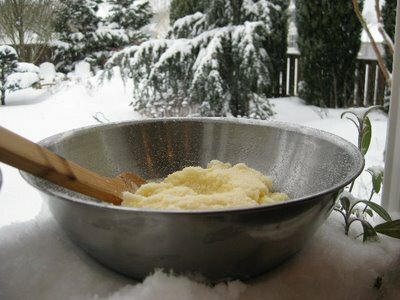 Once mixture is completely frozen, it can either be served or will keep very well if kept outside. Provided outside temperature is below 0C, of course. 1942 experts add that the quicker the snow melts, the quicker the parfait freezes. Hence, it’s recommended to undertake the freezing procedure indoors rather than outside. Once frozen, the parfait should be kept outside in the snow. This entry was posted in Recipes and tagged dessert, eggs.